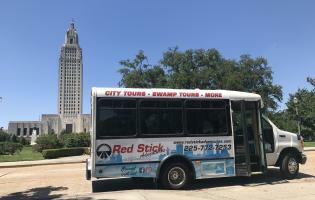 Enjoy a relaxing drive to the swamps in our air-conditioned bus! Experience a private wildlife sanctuary within the Manchac Swamp! Tour the swamp! Explore the wonders of a private wildlife sanctuary swamp on a 1.5 hour guided and narrated swamp tour. Learn about Cajun folklore and culture while enjoying colorful commentary and unique and beautiful landscape. Meet new friends (Maybe even furry or scaly ones! ), come up close and "personal" with a variety of Louisiana wildlife!